It's 255 sales so far this year as Rich Lazzara at Lazzara Lenton closes on the sale of the 24.3m motor yacht Jody Lee with Mark Florman at Latitude 26 Yachts acting for the buyer. A Lazzara 80 model built in 2004 and refitted in spring 2013, Jody Lee is an open bridge motor yacht with an integrated hard top and her muscular power comes from twin 1,550 Caterpillar engines giving her a maximum speed of 32 knots. A notable feature is a pair of custom-built garage pods in her transom designed to fit two Kawasaki three-person jet personal watercraft. 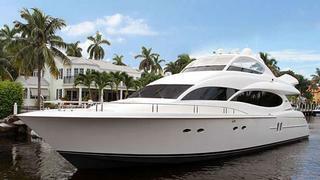 Her extensive flybridge offers a Jacuzzi, large bar and lounge chairs. Downstairs, an expansive main saloon in red cherry wood has a 46 inch plasma television set with DVD player and formal dining for six guests while a custom galley has full size stainless steel appliances with additional seating for informal meals. Jody Lee sleeps 10 people in five staterooms. The master suite features a walk-around king sized bed and has a Jacuzzi in the en suite bathroom. The two VIP staterooms are decorated in Makore wood and are fitted with LCD televisions and have en suite showers while a twin cabin has two bunk beds. The sale of Jody Lee means that there are only 17 more deals to be done this year before the industry reaches the record total of 272 sales in 2012. Jody Lee was asking $2,350,000.